With the Feast Day of St. Cyprian looming upon us (Sept. 26th) and really needing to get back to blogging, I turned to one of my favorite necromancers and long time devotee to this particular Saint, Conjure Man Ali for some basic answers to some general questions about St. Cyprian and working with him. I personally have not worked with St. Cyprian but have been interested in doing so for a while... Maybe this is what I needed to give me that extra "push" to do so. And who better to take instruction from than the The Conjure Man himself! 1) Please tell us how you came to know of St.Cyprian and what drew him to you? 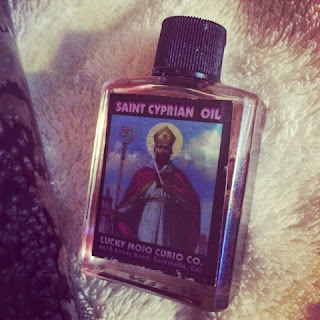 I learned of Saint Cyprian many years back. You could say he was present in my life before I even knew who he was. As a practitioner of magic that skirts the margins and borders between faith and sorcery, I was particularly keen on the balance between the exoteric and esoteric. When I first saw the image of Saint Cyprian I became quite intrigued and it sparked a frenzy of research that led me through translating books, talking to his devotees, and even seeking him out in foreign lands. I consider Saint Cyprian a spiritual ancestor and patron. Like him, I am a professional magician, like him I straddle between the world of the celestial and the chthonic, and like him I walk between faith and sorcery. He has become a constant companion and teacher. 2) How long have you been working with him? I have been working with him for a long time, for over 10 years at least. 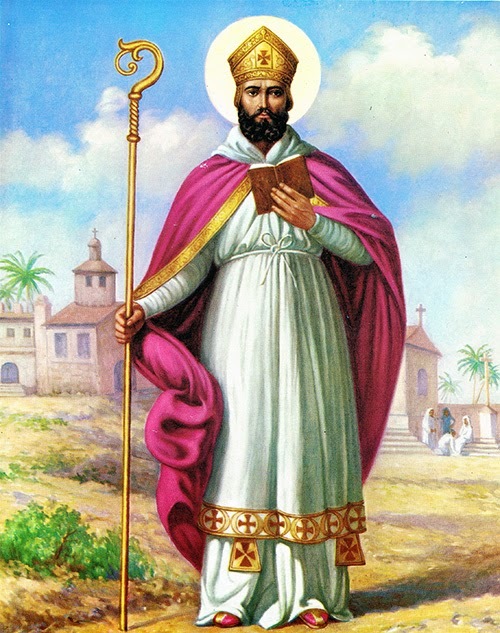 There was a time when Saint Cyprian was a little known saint in the United States, but was a central figure in the Iberian and Latin American spiritual traditions. I am happy to see how his following has emerged and grown over the years. I have a deep relationship with this wonderful saint. I consider him a mentor, protector, and guide. Whenever there is a magical problem I cannot sort, I take it to him. My personal experience has revealed him to be infinitely patient, immensely powerful, but not entirely what I would consider a warm saint. He's not what I consider a comforter, like Saint Anthony. Instead, he can be stern, matter-of-fact, and straight to business. But I find great comfort in that. I know that he stands by me and with his aid there is nothing I cannot accomplish. As a mentor of magic, he's truly helped me develop my abilities and I can say that much of my success can be attributed to the mysteries he's revealed. He's opened the door to amazing new paths and made me into the mage and rootworker I am today. My experience has shown that he is first and foremost a teacher. If you want to delve into the mysteries of magic, he is the saint to seek out. 4) What are the "Do's and Don'ts" of working with this particular Saint? The most fruitful practice I have found is setting up an altar to him and regular devotional works. Taking the time to build the relationship and invite him into your life. In my case, he chose me, but this is not always the case. If you are drawn to him, start off by getting to know him. Most importantly, be sincere in your desire to learn. He is drawn to those individuals who practice magic for magic's sake, whose heart is stirred by the mysteries of the magical arts, and who will further arcane knowledge. He tends not to respond overly well to those who simply seek him out to use him; thinking they can add him as a tool in their box. Many of his devotees tend to be professional magicians, magical teachers, and occult writers. He favors those whose intent is knowledge. For in our world knowledge truly is power. 5) What can he be petitioned for? Saint Cyprian is often viewed as an amoral saint. He isn't immoral, just that he doesn't fall into conventional dualistic morality. Fittingly, he can really be called upon for anything. He is particularly efficient in breaking curses, hexes, and crossed conditions. He can turn the evil traps of an enemy back upon them and even unleash the forces of destruction against those aligned against you. He also has a reputation for coercive love magic. In Latin American magical practice, Saint Martha and Saint Elena are known as the love saints most favored to the causes of women. For men, it is Saint Cyprian. Women can call upon him too, of course, but his reputation is quite strong among men who are seeking a lover. He can also be called upon to work with spirits. 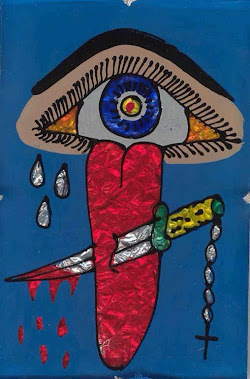 His connections are broad and powerful and he can act as an intermediary between you and the spirits you wish to contact. As a sorcerer-saint, he has his feet firmly in hell and his head clearly in the heavens so he can help you contact angel or demon. He is particularly skilled in matters of necromancy, summoning and binding the dead. He can also assist in developing seership abilities and revealing the mysteries of the dreaming world. 6) What is the best way to establish a good relationship with him? Through regular work with him. A relationship requires work, time, and patience. I often tell my students that it is important to take time to build a connection with a spirit like Saint Cyprian before you make demands. Set up an altar and spend time with him. Bring him into your spiritual world and cultivate his presence. He doesn't require anything elaborate, but does require that you show that you are worthy of what he has to offer. Also know that he doesn't take everyone as his devotees. He can at times seem picky so he doesn't work everyone. Do not be offended if you simply don't click with him. It takes a certain type of person to resonate with this sorcerer-turned-saint. 7) What day of the week is best when working with him? Time of Day/Night? Traditionally Saturday nights are dedicated to him. His feast day is on September 26th. 8) Candle color(s) associated with him? Purple, White, Red, and Black are all associated with Saint Cyprian. Purple is most commonly found in Mexico and the United States. White, Black and Red are commonly found in South America. 9) What are some good oils/herbs/curios to use when working with him? Master root, Acacia, Frankincense, Myrrh, Copal, Cedar, and Wormwood are all sacred to him. Goat's horns, bones of black cats, and black dogs are also commonly found in his works. 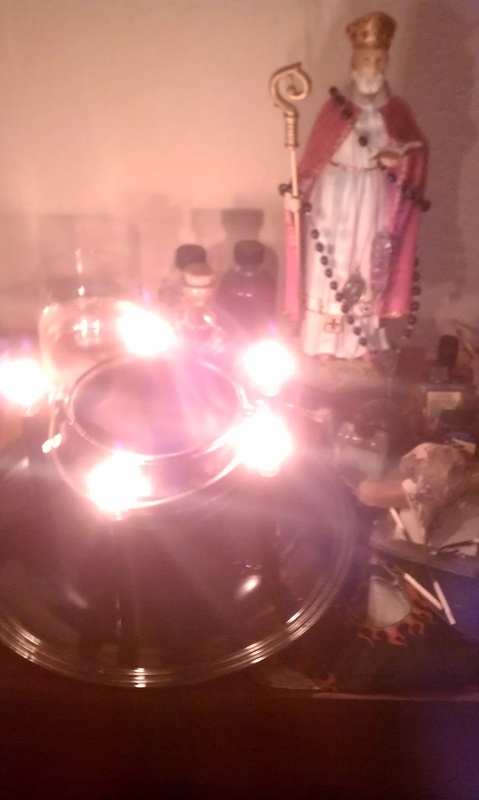 10) I am trying to make an Altar to St Cyprian. What items would you recommend? 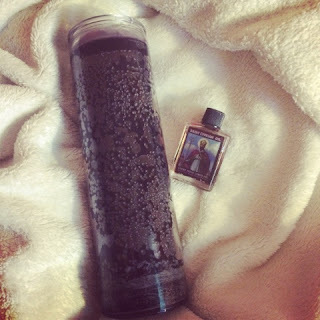 The most basic altars for Saint Cyprian include his image, a glass of water, and a purple candle. Really it is all you need. 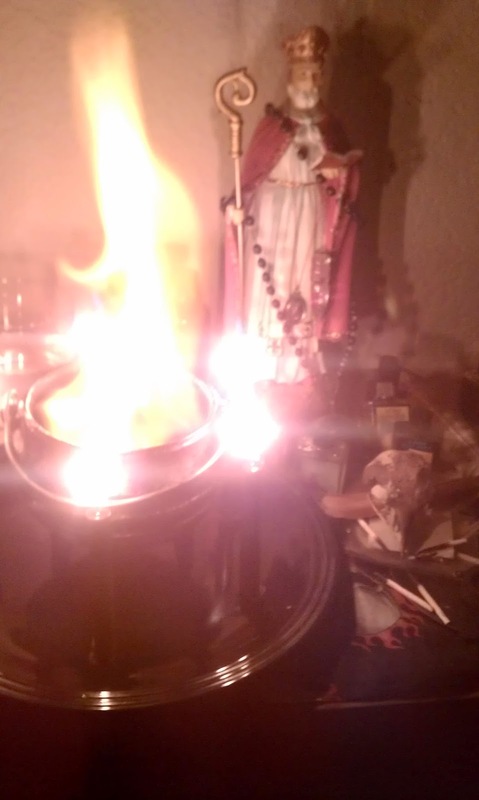 However many also decorate his altar with skulls, bones, rosaries, and a small cauldron. I consider his image, candle, and cup of water essential and all else a good way of cultivating his presence. Start with the basics, then allow his own likes and wants to guide you in building the altar into something a bit more personal. 11) What advice would you give to someone who is interested in establishing a relationship and working with St. Cyprian? Take it slow. This relationship should not be rushed. Even before you undertake any work with Saint Cyprian, make sure that you want to proceed. Saint Cyprian can be an exacting teacher. Once you take the plunge, take your time and get to know him and understand how communication between you two will manifest. I also suggest keeping a cup of water or cup of wormwood tea next to your bed. It will induce dreams where he can come and teach. Keeping a dream diary is really useful to noting important signs and omens. 12) You have authored a book on St. Cyprian, could you tell us a little bit about it? I wrote a booklet on Saint Cyprian a few years back when he was still a relatively unknown figure in the United States. The book was published by Hadean Press ( http://www.shop.hadeanpress.com/saint-cyprian-saint-of-necromancers/ ). The book was written as an offering to the saint himself. Before the book there was maybe one or two articles written about him here or there in English. Afterwards there was a great surge of interest. I do not claim any credit for this, rather it was Saint Cyprian himself who used the book and other mediums to make himself known. I am happy to see how interest in him has grown over the the years. Wow! That is A LOT of fantastic useful information to be had! 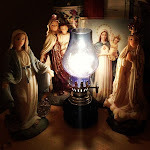 Thank You again Conjure Man Ali for taking time out to answer all these questions and allowing me to "pick your brain" on this interesting Saint. 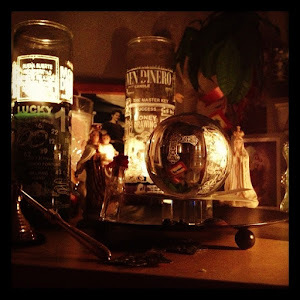 My apologies for getting this out LATE, but I have finally produced my own Mercury Retrograde Anointing Oil! I have sold all but 2 bottles and won't be making more until after this Retrograde passes. I wasn't sure how well it would be received and WOW... I was surprised at how many people really wanted it! I anoint Orange candles with the oil to help combat the nastiness ( i.e. miscommunication, arguments, accidents) that tend to occur around this planetary juncture. I have 2 left for purchase at $7.00 each + $5.95 Priority Mail Shipping. OK folks.... I have to get back to work but I wanted to make sure I posted about the oil before the Retrograde hit. Again, I apologize for this posting being so late! Now I'm off to stock up on Orange candles and Peace Water! *Formally "Love Potion # 9* Now changed to reflect my conjure identity. * Same person.. Different name :) This is an account of my personal experiences in performing Rootwork and being a student of the Lucky Mojo HooDoo Rootwork Correspondence Course. Follow me as I report my "trials & tribulations" as a somewhat fledgling in this practice :) Questions & Comments are welcomed, But keep it clean and polite. I will not hesitate to delete nastiness on my blog. We are all here to learn and grow in this practice. Discrimination and negativity are not tolerated. 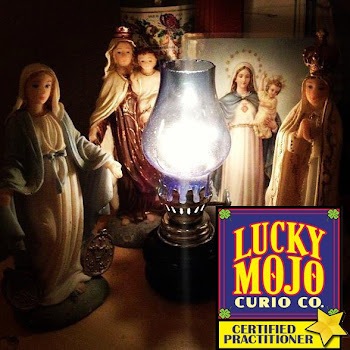 The Lucky Mojo Curio Co.
Legal Disclaimer-As always, I must remind my readers that all items I chose to use or promote are sold as curios only and in no way do I guarantee successful outcomes. I do not claim to treat or cure any illness or condition. Nor do I offer my advice/experiences or workings as a substitute for proper legal, medical, or financial advice. I use and endorse the tools of magic only, not the outcome. The intent and working are up to you!